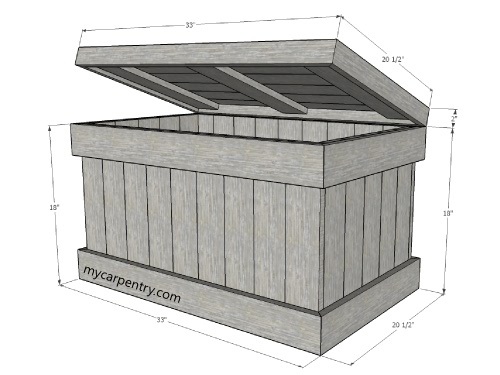 These cedar chest plans are perfect for building a simple container for storing loose things. I built mine to store our collection of bird food and other birding supplies. I am planning to build another one to store jeans and t-shirts. One of the great things about this simple woodworking project is that it is was almost free, since I built it entirely from old fence boards. The only cost was roughly $2.00 worth of finish nails. 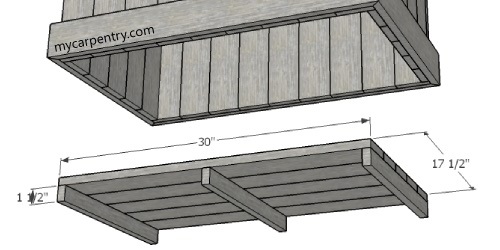 The dimensions on these cedar chest plans assume that you are working with cedar planks that are 3 1/2" x 3/4". The size of this chest was determined by the width of nine 18" cedar planks positioned side-by-side (measuring a total of 31 1/2"). The depth was determined by the width of five 18" cedar planks positioned side-by-side (measuring a total of 17 1/2"). The 18" planks, on both the sides and the ends, are held together by mitered planks nailed on the top and the bottom. This will make more sense as you you read further. * The lengths given are from the long-points of the mitered ends. Sides (refers to the longest vertical part of the cedar chest) - Cut enough 18" planks to build both sides (18). Cut the top and bottom mitered trim pieces @ 33". Lay 9 of the 18" planks side by side on a flat surface. Use a framing square to ensure that they are square. 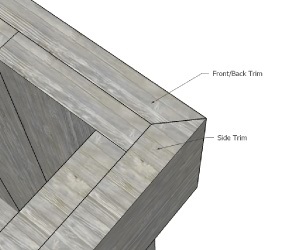 When assembled, the short-points of the mitered trim cuts should meet even with the edges of the 18" planks, and be flush on the top and bottom. Use 1 1/4" galvanized nails or screws to attach the mitered trim pieces to the 18" planks. See the diagrams for details. Ends (Refers to the shortest vertical part of the cedar chest) - Cut enough 18" planks to build both ends (10). Cut the top and bottom mitered trim pieces. 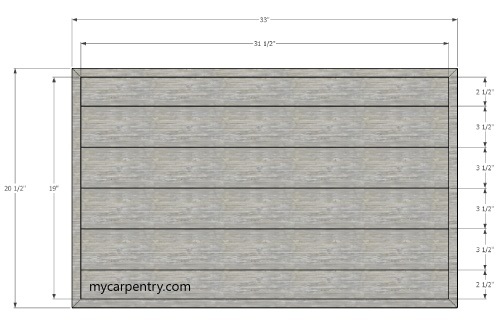 Lay 5 of the 18" planks side by side on a flat surface. Use a framing square to ensure that they are square. 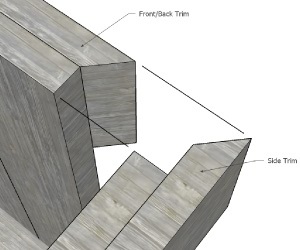 When assembled, the short-points of the mitered trim cuts should measure 3/4" from the edges of the 18" planks, and be flush on the top and bottom. Use 1 1/4" galvanized nails or screws to attach the mitered trim pieces to the 18" planks. The diagrams below show the unattached and attached views so that you can see how the sides and ends fit together. Bottom - Cut five of the cedar planks 30" long. Rip one of the planks 1 1/2" wide. Cut it into three pieces 17 1/2" long. Lay the five 30" planks side-by-side and square them. Attach the 30" long planks to the 17 1/2" rips as shown below using 1 1/4" galvanized nails or screws. Position the assembled bottom inside the sides/ends assembly and secure it with galvanized nails/screws. Top - Cut six of the cedar planks 31 1/2" long and rip two of them 2 1/2" wide. Lay out the planks with the narrowest ones on each end and square them with a framing square. Cut three planks 19" long and slip them underneath the top boards and nail/screw them together. The 19" planks (not shown) secure the top planks together underneath. From cedar planks ripped down to 2", cut two of them 33" (long-point to long-point) and two of them 20 1/2" inches (long-point to long-point). Secure them to the top assembly as shown in the diagram below. I purposely did not add hinges to secure the finished top to the chest. I have it just sitting on top. If you choose to add hardware to these cedar chest plans, there are many variations of hinge/latch combinations to choose from. 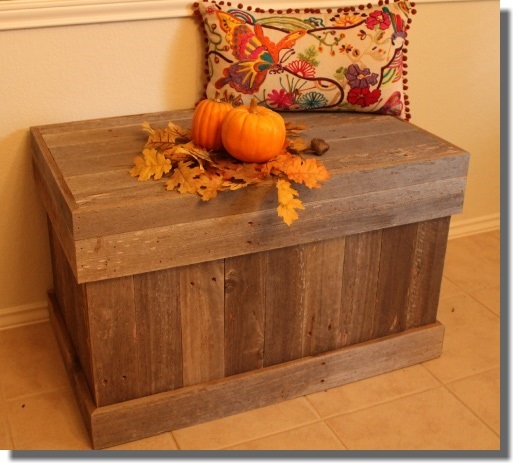 I hope you found these cedar chest plans useful. 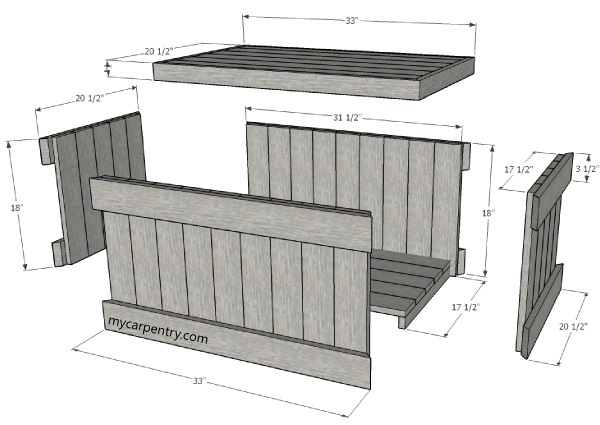 If you have any questions about these or anything else on mycarpentry.com, please feel free to contact-us.